All five Class 802/3s for Hull Trains are in various stages of construction at Hitachi’s facility in Pistoia (Italy), and will be delivered by rail to Newton Aycliffe later this year. The manufacturer is building five five-car bi-mode trains for the open access operator, which plans to put them into traffic from November at a rate of one train per week. This will allow Hull Trains (HT) to dispense with the four Class 180s it currently uses (180109-111/113), but which have proven unreliable in recent times. The operator was forced to cancel 199 services in October-December 2018 as a result of unavailable trains. 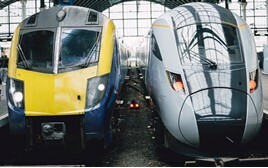 The £60 million fleet is being funded by Angel Trains. 802301-802305 will be moved by rail across Europe, following the same path as their Great Western Railway and TransPennine Express classmates.